Our plums ripen from mid-July to late September. We selectively hand-pick them when they are fully ripened. We grow many varieties of plums, each with its own distinctive flavor. 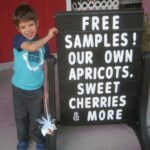 Be sure to sample our fresh plums to find your favorite.